Anne Prendergast has spent 30 years in media and publishing and is currently media director at Strattons: a bespoke advertising and design agency specialising in luxury travel, fashion and interior decorating. A graduate of Bristol University and the University of London she also is a new business consultant for Webpuzzle an innovative, digital content management system. 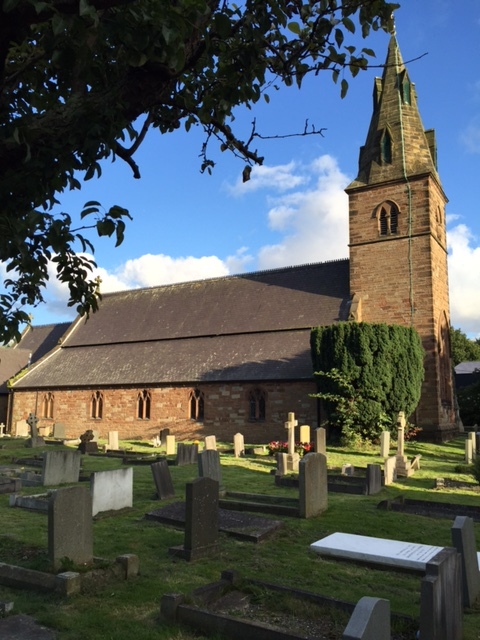 It was a local Catholic primary school, St Mary’s Brewood. Brewood means beautiful wood. The school was a modern school that had been recently built, so when I was a five year old it was pretty new. There were two distinct parts to the school: one part was the infant class for five-seven year olds and the senior class for nine to elevens. But between seven and nine you would go into a separate part of the school called the Old School, designed by Pugin. It was a neo-gothic structure with big, arched doors and wrought-iron latch keys to enter and it felt grand and impressive like nothing else, very important in some ways. 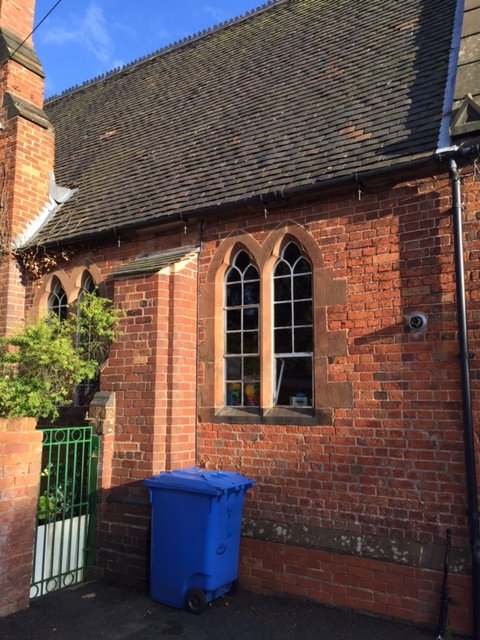 St Mary’s Catholic primary school, Brewood, Staffordshire. 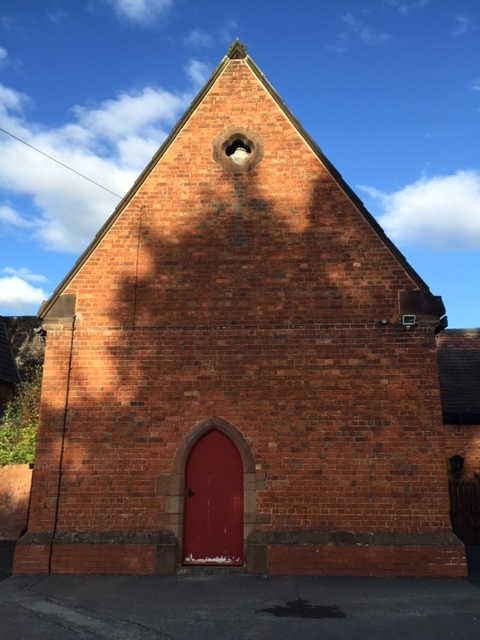 Was the Pugin-designed Old School used by the whole school? No. Even though it was only two minutes’ walk away from the new building it was definitely a very separate structure. It had huge disadvantages, like outside toilets, which were pretty grim and primitive and very cold in the winter. They were part of the original building as far as I could tell. You would enter into a large entrance area with hooks for everyone to hang up their coats. The hooks were almost Shaker style but made with iron rather than wood. You could get fifteen people standing up inside the entrance porch quite easily. 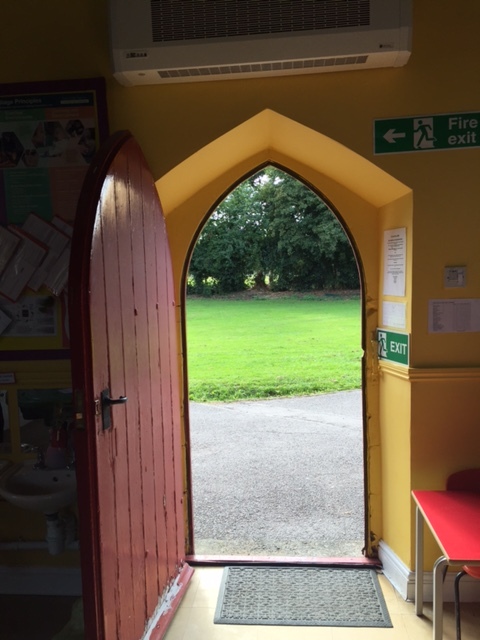 Then you would go through the second arched door into the classroom. By the age of seven we would go to school by public transport on a bus. That meant that sometimes we might be late and the other children would already be inside. Every morning would start with a hymn and prayers and so sometimes if you were late (and God help you unless you were on that bus) you would wait in the porch until you heard the singing stop and then enter. That was the law according to Sister Casimir (the teacher-nun and headmistress). Then we’d go into the rectangular (classroom) space with a small office at the back of the room down some steps with an arched doorway. That was the headmistress’s office. We’d be lined up at desks in rows by age, so at age seven you’d be on the left of the class and by the age of nine on the right. It was very rigid. Did you ever collaborate with anybody on any project, did those desks move? Never! And I don’t think we did collaborative work. Everything we did was at our desks and we’d bring our work up to Sister Casimir’s desk next to the piano and she’d mark your book and you’d go back to your desk. Was there anywhere else to go in the classroom? Once you were there you were there and God help you if you twitched a bit! There were no windows at eye level for a small child. They were arched windows, but there was no view and nothing to look out on, so you weren’t distracted by that. Sister Casimir was an old-fashioned nun, quite stout and with a full Dominican black and white outfit, a big rosary from her side and an enormous heavy ring on her finger and she had absolutely no qualms about hitting you on the head with it. Was punishment immediate, or were you sent somewhere to reflect on your misdeeds? Oh no, it was immediate. If you were talking in class she’d come over to your desk and hit you that way. Or if you brought your work up to her desk and she didn’t like it then she might hit you. I vividly remember the red terracotta tiled floor of the classroom because she wouldn’t stop hitting you until you were prostrate on the floor. So I think those people who got hit quite frequently would just learn to dive to the floor. But I didn’t get hit that often so I was always quite shocked when it happened to me. But the thing is, it was completely normal, although we were never hit in the other class. And I had no idea that it was happening when I was in the reception class. Sister Casimir was just a force of nature. And if someone was badly behaved one of the other classrooms were they sent to her, the headmistress, for punishment? No. And I think by the time I got to the age of nine she had retired, so she would have been in her sixties. But she was equally charming and she would reward you. So it was carrot and stick. How would you be rewarded? It was a great privilege to be allowed to make Sister Casimir’s afternoon cup of tea and if she thought the class had behaved well she’d give everyone a sweet or cut up her apple into ten parts and each of us would get a piece of apple. It wasn’t about the sweets, but the privilege. When you were allowed to make her tea, you would go down the three steps at the back of the classroom into her office through the big gothic door and that was the only time that you were allowed in her office. You knew where she kept her biscuits and her tea. Were you ever tempted to have a sneaky look around? No, we weren’t. But I remember it was quite cosy, a nice space. I don’t remember it having any windows. I think we just enjoyed the privilege of being there, of being allowed to be there with a friend. And this happened every afternoon and I frequently got to make the tea so I was as happy as Larry. So you balanced out this bizarre behaviour of ‘I will get beaten to the floor because I failed to spell because correctly’, but on the other hand I got to make her tea, which was the world’s greatest privilege. So she was quite savvy, I think, in knowing how to control us. And it was about control. We had incredible discipline. She wasn’t a sympathetic woman or ever affectionate and she had such clear cut opinions about anything and everything and there were no deviations from it. I think we had school uniform after she left, but I do know if you didn’t have the right jumper on she’d find that incredibly offensive. But also I heard she was very generous and fought hard on behalf of the children. I remember a boy in my class who had been deprived of oxygen at birth and was not well-co-ordinated and may have had some mild learning difficulties. But every morning he would have to be dragged into the school through the porch and into the classroom while the rest of us were sitting down, literally kicking and screaming. He was terrified of Sister Casimir. His poor mother. This terrible tug of war would go on. Sister Casimir would slap his legs and we all witnessed this terrible drama every single morning. I remember thinking, I feel really bad for him, but on the other hand I hated being put through this drama every morning. But I’m told that even though she did drag him in every day, she had fought incredibly hard for him to be at the school, as opposed to a special school, and went out of her way to achieve that because she thought that was in his best interests and his parents were always very grateful to her for that. Everything is so public! Even if it wasn’t happening to you every single day, it was happening to someone every single day, so there was never a day when someone wasn’t being bashed about. There was that sense of tension and stress of you next! Can you imagine schools where children might have some private space, having been so exposed in your own classroom? I suppose it’s about how private is private. It was a very noisy environment in the classroom because there were different lessons going on in one room and if you weren’t quite focussed, it would be very easy to be distracted by things around you. Some people found it quite hard to concentrate. Instructions were given to one row at a time and the others were given things to do while they were being taught. We all had scripture lessons and anything religious at the same time. Do you remember a difference between the morning and afternoon sessions? In Sister Casimir’s class everything was highly regulated: hymns; prayers; lessons; more prayers; then up the road to the school dining hall that was part of the presbytery at the church. You’d walk up the lane to get to it in a crocodile of pairs. 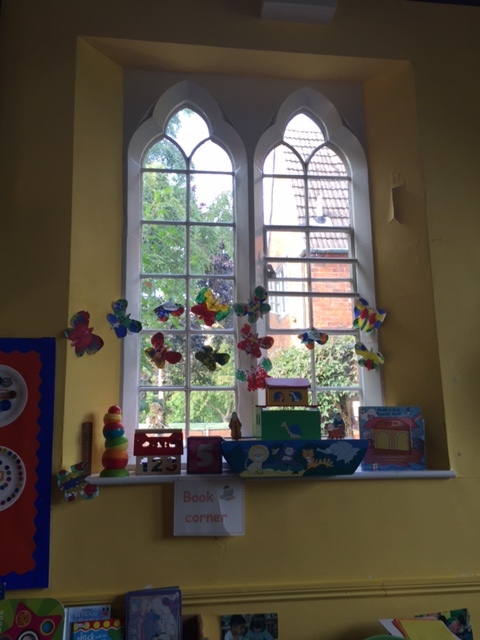 It was quite monastic, benches and tables, thick solid walls, arched windows up high, whitewashed brick, terracotta tiles, the same as the school, very functional. Freezing cold. The school was cold too, looking back on it, but not sufficiently that it bothered me. I do remember it was a terrible thing to go outside to the toilets. You’d come back from lunch and have more prayers and then have your afternoon lessons and then Sister Casimir’s afternoon tea ceremony and then I’m pretty sure that before home time you were told to read something, or if Sister Casimir was in a good mood she’d read a story out loud. And then prayers and then home time. And the only escape from that rigid routine every day was that after you’d taken your first Holy Communion you were allowed to go to confession in the church. So two-by-two we were allowed to leave the classroom, unaccompanied, go into the church, make our confession and there would be six children at a time – two waiting to go to confession, two doing penance – and then you’d walk back to school. It was quite creepy: you had to walk through the creepy graveyard, and then inside the church, very quietly, you waited to tell your sins and then you’d come out with an Our Father. And because the church had two side chapels and one main altar, if you had three prayers to say, you’d say one at the side altar on the right, one at the main one and one on the left. So if you were saying your first prayer on the right hand side altar, there was a full sized cross with Jesus and quite grim, very lifelike and we all used to, I don’t know how or why, we used to kiss his feet. And they were quite cold. Was that part of the penance? No, I don’t know why! No one ever told us to, it was the done thing. If the priest had seen you? He would have thought it was quite blessed, but we did it to freak each other out, it was a gothic horror thing to do. We’d dare each other to do it and we couldn’t be seen to not do it, even though it wasn’t very nice! Was that your only escape from the classroom? That was the only time, except for play times, that you were allowed freedom. I think we craved some autonomy because our lives were very controlled. But when I went to the nine to eleven class and Sister Casimir left the school we had a hippy 1970s head teacher who used to let us run riot. Virtually the entire summer we just did pottery and sport, playing rounders on the sports field all afternoon. It was fantastic, what child wouldn’t love that, but we did no work, never mind that I was already cheating at my maths exercise books, writing lots of stupid poetry about the daisies and spending all afternoon playing. So we’d gone from this incredibly disciplined, rigorous time with Sister Casimir to this! Do you think Sister Casimir made use of the gothic environment of the Old School? I think she would have been the same whatever environment she was in, she was a force of nature. No, never. You’d have your separate prayers in the classrooms. Did you feel a sense of relief when you moved onto the next class? Well, strangely I liked her. She thought I was a bright child and so I got to make the tea more than anyone else and she bought me, basically. Minor privileges! It was a generational thing, an institutional thing – going from someone who was a nun to someone who was a man, that was also odd, having a man, and 30 years old max and just incredibly liberal and hippy really. Did the teachers run the other two classes in the same way? No, utterly different. Different spaces because they were modern. Was the infants classroom very different from the others? Yes, it was the only place where they didn’t have individual desks so you’d sit in groups of eight at tables. For maths we used to use rods: wooden blocks. I remember we used to get a lunchtime meal, which was a bit gross. And I remember the warm milk left out in the sun. I really loved the red-plastic milk-bodger that we used to make holes in the foil to poke the straw through, it was a bit like popping bubble wrap. The five to seven year olds class and the nine to eleven class were perpendicular to each other and had an adjoining area which were common, with indoor toilets – oh, the luxury! – and there was an adjoining room, a class library. And if you were perceived as intelligent and interested in books you could be the class librarian. And that was mine and I adored it. Unlike Sister Casimir, the other teachers were in their twenties and philosophically utterly different. It was very 1970s laissez-faire. In the senior school we wrote lots of poetry: Sister Casimir would have thought that was mad. There was an outside garden where we planted spring onions and peas. In the senior school, the classes were lined up in rows. There was a shelf at the back of the classroom where there were answer books. You were set the questions for maths at the start of the morning. I wasn’t so good at maths and I didn’t really enjoy it, but you could go to the back of the class and copy out your answers. And mark your own work, give yourself ten out of ten. Happy days! And the teacher would never bother to check and it was all very, you know, nobody checked or marked anything, I don’t remember ever being taught any maths at all or even covered the basics. Because I was the school librarian, if we’d finished the maths, which I could do in ten minutes if I copied the answers, I was allowed to go to the library for the rest of the time. So I would go to the library where there were two armchairs and a load of books and I’d go and sit there and read. And could you just sit and read? Well nobody else ever used the library, or noticed that I’d gone. And the only other time I ever saw any other kids using it was when the mobile library would come and you’d be able to choose x number of books. And we all loved it, thought of it like a free shopping spree, that was most people’s only interaction with the library – to change their books. We used to have to sit in rows, but the boys had to sit at the front of the class and the girls were at the back. My seat was the very last seat at the back of the row, at the back of the class. So if I were to get up to go to the loo, say, I could just go past there and into the library. And because it was such a noisy environment, I wouldn’t be noticed. Did you crave a quiet space? No, I was bored, there wasn’t enough going on. I thought I was more likely to get caught doing something conspicuous in the room than if I wasn’t there, bearing in mind there was only one teacher teaching between twenty five and thirty people of three different age groups. I suspect a male teacher didn’t worry that much time worrying about whether an 11 year old girl had gone off to the loo or not. If I came back and someone asked where I’d been I’d say ‘Oh I was just exchanging my library book’ and nobody would seem to notice it had taken me an hour and a half to change that book. I used to think the other kids were a bit passive not to make their escape but maybe they didn’t see the opportunity like I did. Presumably you didn’t talk to other children about it? No, I didn’t because I didn’t want them to come into my secret space, I did feel very proprietorial about it. And when any other kid came in to exchange a library book it was my job to stamp it in and out. I’m surprised you didn’t turn out to be a librarian. I’ve often thought about it and I still spend a lot of time in libraries. There was a mobile library that came to the village every week and I’d go to that every week. As I got older I’d go to Wolverhampton public library every week, it was part of my social life to go there, look around the shops, fail to buy anything and then go to the library and spend a couple of hours there with the books. No, I could already read. I think you just had to come up and read out loud to sister Casimir at her desk. Do you remember hearing others read out loud? I think most people automatically went to my secondary school from my primary school. It was a newish building. I remember we had some pre-fab huts as well. My primary school didn’t have any stairs and my senior school was a three-storey building and they’d just built a brand new music room with practices rooms. I remember being quite frightened about being late or lost, because the primary school I went to was so little and only having one teacher for two years, and I found the concept of having to move from classroom to classroom quite weird. Having a timetable and having to move classrooms and not knowing what was where, that all seemed very complicated, but you get used to it. The sixth form had a common room, like a lounge, we could play music and make coffee and tea Very grown up. Did you ever think about the design of schools, having been in such radically different environments within your school career? At secondary school we were asked to write about our ideal school in an English class and draw a school plan. We were about 13 or 14. I can’ remember much about what was in it. I don’t draw very well and have a poor sense of scale and I remember spending hours on squared paper and it having an extravagant amount of swimming pools. Were there several private libraries just for you in your design? Have any of the offices where you’ve worked reminded you of school? I don’t like open plan offices at all. I like a private space in an office environment. Yes. I find it difficult to write in a noisy environment. I’ve had my own offices, but I’ve never done anything with them. I’m incredibly untidy, with piles of paper, so that’s a slightly psychological barrier. It drives me mad at home if the doors aren’t closed. I cannot sit down in a room with a door that is open unless it’s meant to be. Perhaps that Pugin classroom was not a good place for you, architecturally speaking? As a child, yes, sort of enclosed in some respects but open in others.